In 2014/15, Danihers Facility Management will again be represented on the committee for our industry body, the Victorian division of the Building Service Contractors Association of Australia (BSCAA). The peak body for the building services industry in Australia, BSCAA gives members guidance, resources and best practice advice for the industry. My role on the BSCAA Vic committee will allow me to continue to make an even more meaningful contribution by improving services and participating in policy development on important issues. I urge everyone in the building services industry to get involved with the group and have the opportunity to learn, network and make a difference to our great industry. One of the highlights of the BSCAA calendar is the annual industry excellence awards held in December. 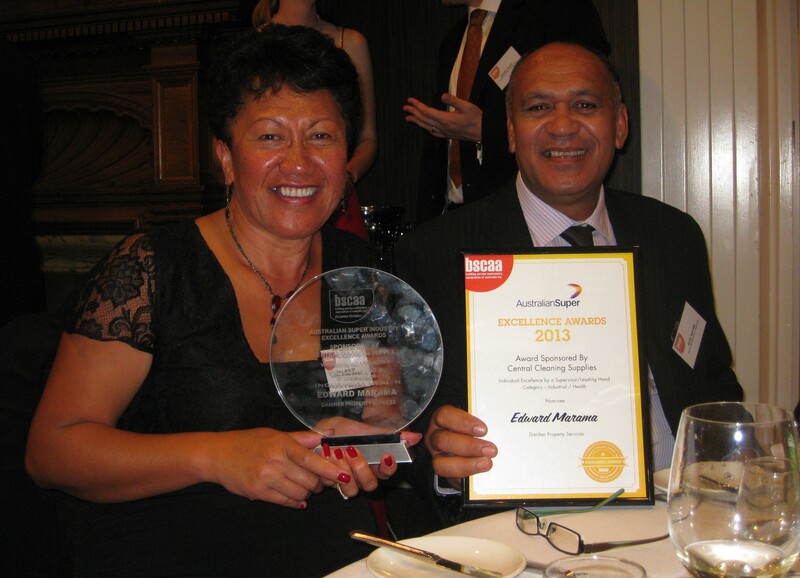 It’s always a great night and last year one of our team members, Eddie Marama (pictured below with his wife Puna), won an award for Outstanding Achievement by a Supervisor or Leading Hand. Eddie is a dedicated leader in our team at CSL Broadmeadows and it was wonderful to see him recognised by the wider industry. For more information about the BSCAA Vic committee for 2014 read this article from Inclean magazine. Visit www.bscaavic.com.au to learn more about our industry body.